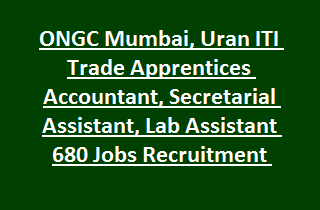 Secretarial Assistant, Store Keeper, Laboratory Assistant, Computer Operator, House Keeper, Cabin/Room Attendant and other Jobs in respective trades under Apprenticeship ACT 1961- Mumbai, Uran. There are total 680 ITI Trade Apprentices Trainee vacancies available in ONGC Mumbai/Uran Recruitment 2019. Interested/ Eligible applicants have to submit completely filled applications to the ONGC Mumbai/Uran on or before 28th March 2019. Candidate selection for this trade apprentices at ONGC Mumbai/ Uran recruitment is based on their Percentage in academic qualification. Age of the candidate should be between 18 years to 24 years as on 03-28-2019. Other details of vacancies, Age criteria, Training period, Educational qualifications, Pay scale details of Oil & Natural Gas Corporation Limited ONGC Mumbai/Uran ITI Trade Apprentices Recruitment notification are mentioned below. Total no of vacancies available in ONGC Mumbai, Uran Recruitment are 680 posts. Vacancies available in ONGC Mumbai: 560 posts. 2. Computer Operator & Programming Assistant: 32 posts. 3. Data Entry Operator: 10 posts. 4. Cabin/ Room Attendant: 30 posts. 7. Electronics Mechanic: 02 posts. 8. House Keeper (Corporate): 10 posts. 9. Library Assistant: 04 posts. 10. Laboratory Assistant (Chemical Plant): 23 posts. 11. Information Technology & Electronics System Maintenance: 28 posts. 12. Secretarial Assistant: 327 posts. 13. Mechanic Diesel: 04 posts. 14. Store Keeper: 15 posts. Vacancies available in ONGC Uran Recruitment are 120 posts. 2. Cabin/ Room Attendant: 02 posts. 3. Boiler Attendant: 02 posts. 4. Computer Operator & Programming Assistant: 04 posts. 5. Electronics Mechanic: 07 posts. 8. Information Technology & Electronics System Maintenance: 06 posts. 9. House Keeper (Corporate): 03 posts. 10. Instrument Mechanic: 05 posts. 11. Library Assistant: 01 post. 12. Laboratory Assistant (Chemical Plant): 10 posts. 14. Machinist/ Turner: 03 posts. 15. Welder (Gas & Electric): 01 post. 16. Secretarial Assistant: 23 posts. Accountant: 12th pass under 10+2 system with Commerce & Maths. Secretarial Assistant: Must have pass 12th class under 10+2 system. Laboratory Assistant: Must have passed 03 years full time BSC Degree in physics/ Chemistry and also have Trade certificate in laboratory Assistant. Follow the ONGC official notification for more qualification details. Candidates will be offered stipend as per ONGC Government rules. Age of the candidates for this ONGC ITI Trade Apprentices is 18 years to 24 years as on 28-March- 2019. Candidates will be shortlisted based on their marks percentage in qualifying examination in respective trades.